I am so excited to have been invited to RAWartists showcase in Denver this fall. The event is an inspiring combination of visual artists, performers, musicians, fashion designers and more. I am attending as a visual artist and will be sharing my “Sphere’s of Self Realization” series with everyone, as well as other shields and mandalas. Tickets are $22 and if you follow my link it helps cover my cost to participate in the event. Hope to see you all there! Its going to be so much fun. To serve independent artists with tools, resources, education and exposure needed to thrive and succeed in their creative careers. RAW showcases indie talent in visual art, film, fashion & accessories design, music, performance art, beauty, and photography. RAW is a fun and alternative way for creatives to showcase both to their local community and the world-at-large. How does someone reach a level of prestige that they can create a piece of art on the same scale as a building? How does someone become one of the most acknowledged living sculptors of their time? 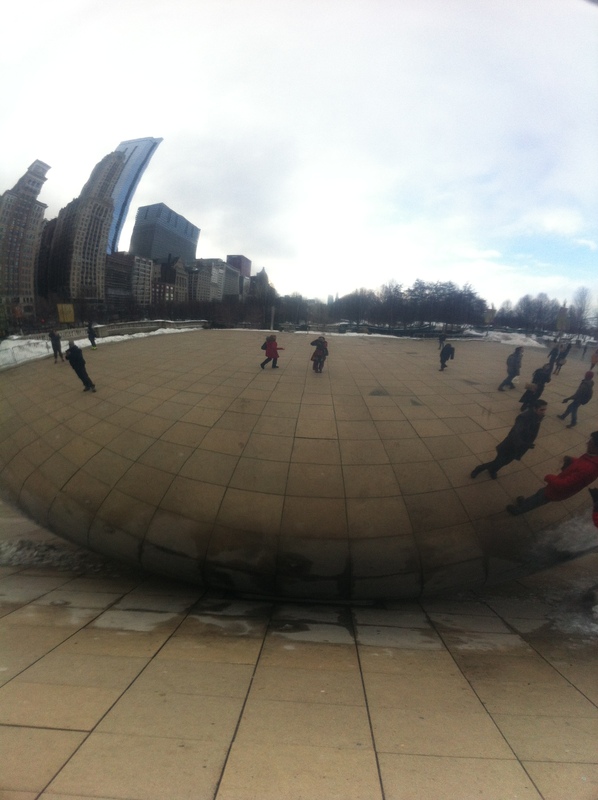 These were the question that came to mind as I wandered through the Millennium Park in Chicago up to the Cloud Gate. This massive public work is smooth, mirrored anomaly juxtaposed against the towering Chicago skyline. It captures the space between the lake and the city reflecting everything around it in a mesmerizing way. Despite being freezing cold, and sky being a gray mass overhead I still found myself enchanted by the piece for a good twenty minutes. I could see myself as a tiny dot on the surface as I walked closer. No one stopped me touching the polished surface, which still reflected everything seamlessly despite being covered in smudges and soot. I walked the perimeter enjoying the changing panorama of Chicago behind my reflection, distorting in the convex surface of the structure. I ventured into the “gate” under the structure, which defied understanding to look upon. The world turned into a mandala above my head, bending and blending as I strode to one side or the other, my face upturned. After having enjoyed interacting with the sculpture on my own I stepped aside and watched other visitors explore and play with the strange shape. I laughed to myself as “I’ll Be Watching You” by the Police floated up from the ice rink below the sculpture. Cloud Gate was created by Anish Kapoor in 2004 for the AT&T plaza in the Millennium Park. 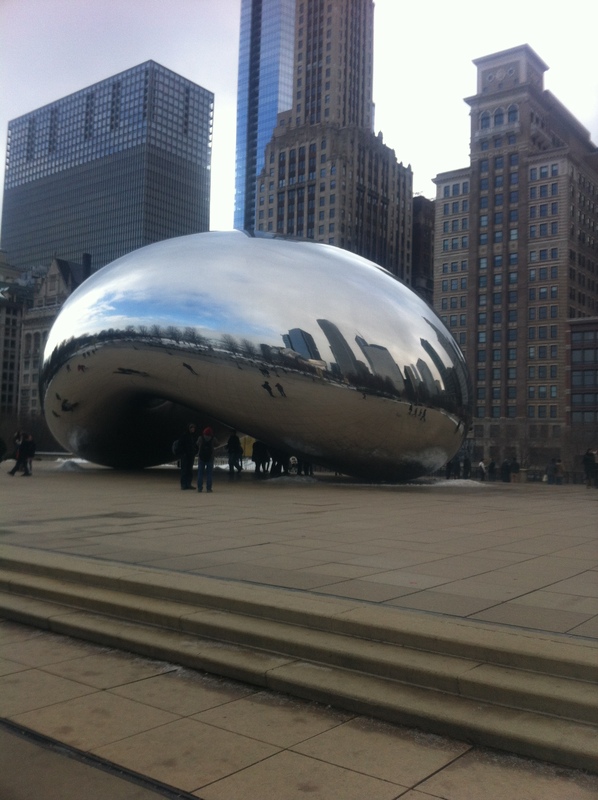 “Cloud Gate is a single object of around 25×15×12m. 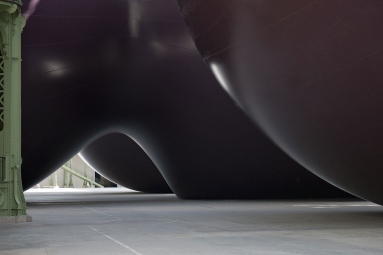 It is made of polished stainless steel and is seamless, (http://anishkapoor.com/322/Cloud-Gate.html).” Kapoor was born in India, and went to art school in Britain in the 1970’s. After completing art school he went on to win many of the most prestigious arts awards for British Artists. Even his most early works were concerned with the “in-between”. The strange fractal image created by the 12ft arch inside the sculpture. Kapoor’s earliest works that brought him to the 1982 Paris Biennale and the 1990 Venice Biennale were on a much smaller scale than later works. 1000 Names consisted of sculptures of various geometric shapes that appear to be on the edge of either being finished or falling apart, where the artist used pigment to create them. When asked how he came to these ideas he said he wanted to “create something out of color.” Void Field consisted of a room of stones punctured by holes in the middle. I first saw Kapoor’s work when I was studying abroad in Paris. He had been chosen to create a piece for the Monumenta 2011 which is a work intended to be created on a monumental scale that interacts with the Grand Palais. For the project Kapoor created Leviathan. The piece filled the majority of the Grand Palais and could be experienced in two ways. The first was on the outside. It was like a sleeping colossus that filled the majority of the space. You had to navigate around the edges of it, and it completely displaced the viewer. Trying to capture a picture of it was impossible as the scale was simply too large. From the outside it looked black and felt taught and full to the touch. You could also choose to venture inside. It was like stepping into a fantasy world. 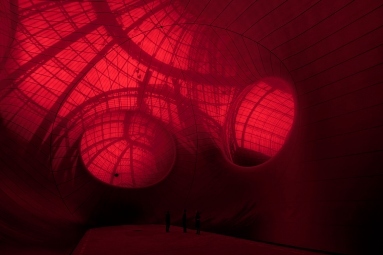 Inside evoked images of a womb or a blood canal. Suddenly everything was red. The people, the walls, the floor, the light. Everything was consumed by the color. The air was still and dampened. It was hard to hear, and it smelled of plastic. Somehow the space inside seemed even larger than the space taken up outside, which boggled the mind. I didn’t linger long inside because the whole experience was unsettling. At the time the same questions jumped to my mind. How do you get this successful as an artist to make something this big? Having mulled the question of Kapoor’s success over for a while I have come to some conclusions. Kapoor isn’t trying to say everything at once. Each piece he creates is a confined experience. Many artists I have seen recently try to weave every little idea into their work, as if that somehow makes it more meaningful and important. For me it simply confuses the piece. Examples include Mea Culpa by Mary Kelly and The Invisible Enemy Should Not Exist by Michael Rakowitz. My own work suffered from this while I was in studio classes in college and think simplicity is in the end more successful. Second, Kapoor encourages his viewers to interact with his work. Because his pieces explore the boundaries of space they inherently encourage the viewer to also explore those boundaries. He claims his breakthrough piece was When I am Pregnant. “When you are in front of When I am Pregnant, no matter how close or far away you are, it is a blur. 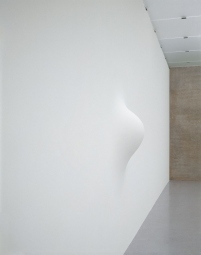 It is only when you move to the side of it that you can see it is a form.” (Anish Kapoor, Interview with Nicholas Blaume). Forcing the viewer to interact simultaneously forces the viewer to think about the piece, and creates deeper meaning. Ultimately, Kapoor’s art captures the interest of his audiences. Any piece of contemporary art that can engage an individual for more than a few seconds has accomplished something. I have visited art museums with friends and families who aren’t particularly interested in the arts and they fly through them, briefly glancing at most pieces, occasionally lingering at one or two others. I myself have been guilty of sighing at the sight of contemporary works. For the most part, to understand contemporary art you need to read the material provided with it. 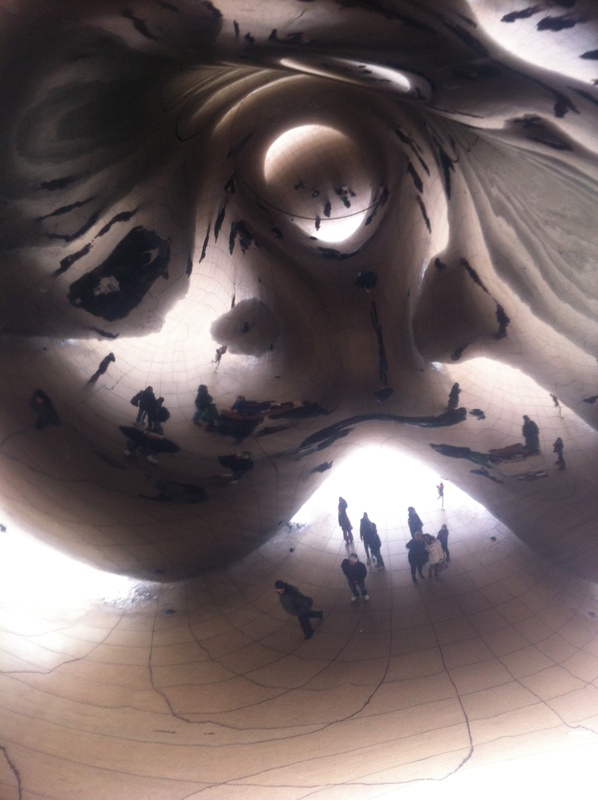 Plenty of people were lingering to explore and play at Cloud Gate, and I was surprised to find no information about the piece or the artist at the actual site. It didn’t need to explained to be interesting, thought-provoking, and highly successful piece of public art. 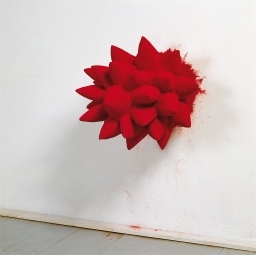 For more info on Anish Kapoor check out his website. Some artists discover their medium over a lifetime of work, others stumble into it unknowingly, and few fall in love at first sight. Kim Dickey knew she wanted to work with ceramics after finding it in sixth grade. Dickey had a quick rise into the ceramics world, being represented by the Garth Clark Gallery in New York when she was still in school. Her works sold quickly, and she was in high demand without access to the materials she needed, like a kiln. Although extremely young the pressure pushed her to succeed. Dickey had just been hired by the University of Colorado when the Rule Gallery found her exciting and innovative sculptures. They have represented her ever since. Dickey’s work walks the fine line between nostalgic narrative and modernism. The magic is in the simplicity of her work. Although highly detailed, each sculpture always contains thousands of little parts; the overall feeling is always calm and undemanding. Her work is so subtle in some cases that it can almost be overlooked. Gardens are often the subject of her sculptures placing childhood memories of hedge gardens side by side with minimalist forms. 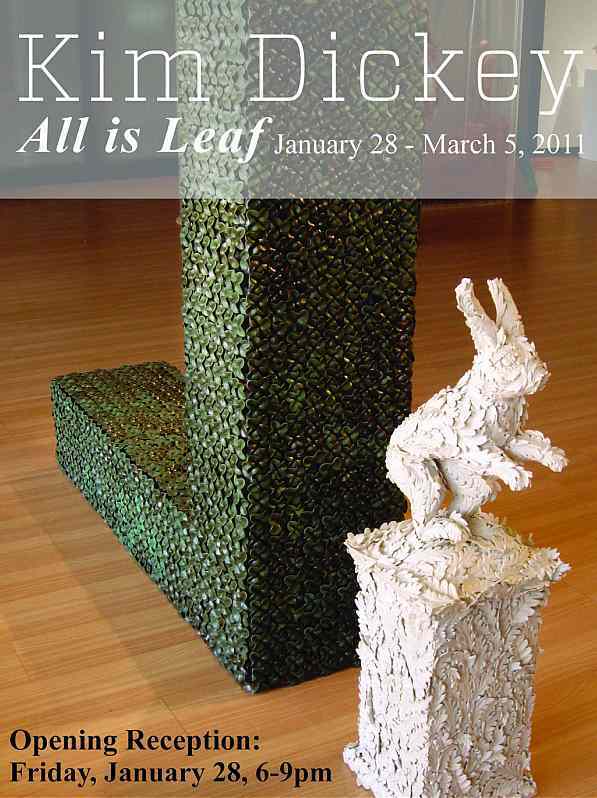 Dickey’s installation at the Rule Gallery in March, “All is Leaf,” embodies the hallmarks of her work. “All is Leaf’ was designed specifically for the long, thin space of the Rule Gallery. Eleven unique sculptures are placed throughout the space, guiding the viewer through the fantasy garden Dickey has created. 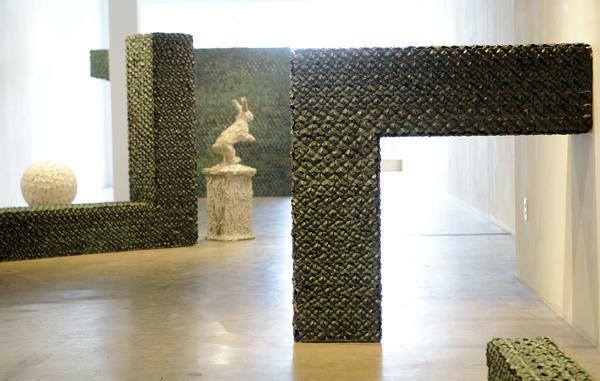 Eight large green sculptures pay homage to minimalist forms, including long rectangles along the floor, a large half arch, and L- shaped beams. While clearly drawing their shapes from minimalism they also mimic the architectural construction of a hedge maze. 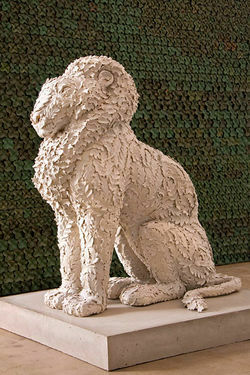 The other four sculptures are small and white, taking the shape of familiar garden characters; a lion, a running rabbit, a hawk, and a small round bush. Every sculpture is covered in thousands of identical leaves, glazed green and white respectively. The white rabbit sculpture is especially evocative of Wonderland, and the lion conjures up imagery from “The Lion, The Witch, and The Wardrobe.” Even the size of the sculptures enforces an idea of childhood. The Arch in the first sculpture you see as you enter and it is clearly too small for a full sized adult to pass through. One would have to crouch to go through it. The sculpture cuts the gallery in half, obscuring the back half. This gives the installation feeling of adventure, mystery, and secrecy; its almost as if some secret from the past could reveal itself amongst the sculptures. The childish nostalgic feeling of the installation is kept from being overwhelming by the strict geometric forms. Clearly drawing from minimalism, anyone with a knowledge of art history can’t help but think of Robert Morris’s 1964 exhibition. “He displayed then-radical works derived from basic construction components, such as an L beam or plank, (Macmillan).” Dickey uses some of the exact same shapes from Morris’s installation in her own work. Unlike traditional minimalist sculpture, Dickey’s installation flaunts its adornment. Traditional minimalism revels in the simplicity of a cube or rectangle. This aesthetic is completely ignored in “All is Leaf” with every sculpture being completely covered in ceramic leaves. Without the detail of the leaves much of the charm would be lost. 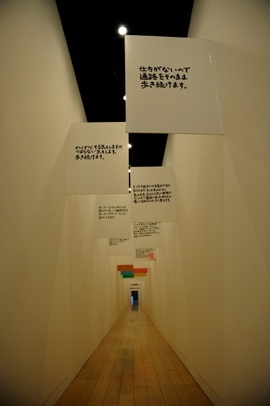 This installation was a definite must see, and although simple at first glance it is layered with meaning. Every detail of the installation is highly considered. No leaf is left unturned, reaffirming Dickey’s place in the ceramic world. Her quick rise to fame alongside this remarkable set of sculptures makes it clear the Kim Dickey deserves to be as highly regarded as she is. Campbell, Michele. “Kim Dickey.” RULE Gallery. Web. 17 Apr. 2011. <http:// http://www.rulegallery.com/>. Deam, Jenny. “MORE THAN A PRETTY POT – Ceramic Artist Kim Dickey a Study in Contrasts.” Welcome to Denver Woman Magazine Online! Web. 17 Apr. 2011. <http://www.denverwoman.com/1008/arts1.html&gt;. MacMillan, Kyle. “Art Review: Kim Dickey’s Gardens of the Mind at Rule Gallery.” Colorado Breaking News, Sports, Weather, Traffic – The Denver Post. 11 Feb. 2011. Web. 17 Apr. 2011. <http://www.denverpost.com/art/ci_17343412&gt;. “Meet the Speakers- Kim Dickey.” Australian Ceramics Triennale. Ed. Shannon Garson. 26 May 2009. Web. 17 Apr. 2011. <http:// australianceramicstriennale.blogspot.com/2009/05/meet-speakers-kim-dickey.html>. Zhang Huan is a contemporary artist, primarily involved in performance art. Over the past couple years he has flitted in and out of my perceptions, but this last semester I learned about him in much more detail. The work that brought Huan into the spotlight for the contemporary art world was 12 square meters (1994). While living in a rundown house in a small provencial town outside Beijing, Huan decided to create a performance commenting on the conditions of where he was living. The rental only cost him .75 cents a month and contained a shared bathroom with no door or running water. He sat naked for 2 hours covered in honey (or sugar water depending on the source you read), and fish sauce while flies slowly became stuck to him in the public bathroom. He did not move for the entire time, except to blink the flies away. After the 2 hours he walked to the nearby pond, which was also highly polluted, and walked until he was completely submerged. In photographs documenting the performance you can see the swarm of dead flies floating around his head, which had previously been attached to him. All of Huan’s works comment on the world around him through taking his body and consciousness to the extremes. His body of work reminds me of other performance artists such as Marina Abromovic, and artists from the Gutai movement in Japan. The information for this post was abbreviated from my Art in China lecture at University of Colorado with professor Park. I have decided to keep myself from losing steam on this project I am going to start posting info on artists that inspire me as well as my own art. I am also going to add “Sketchbook Saturday”, “Medium Monday”, and “Terrible Tuesday”. The rest of the week will be me just posting whatever suits me. 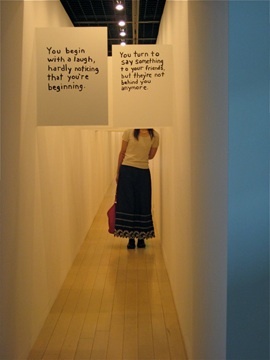 Today is Thursday so I am posting about an artist that inspires me: Miranda July. She was named one of the top 25 indie filmmakers in 2004. Her body of work is quirky and often focuses on empowering women. She also has worked with bringing the arts to youth through projects such as the Joanie 4 Jackie project. She is constantly engaging her viewers in active participation. Without an audience to move through or help create the work it is unfinished, unlike a painting or sculpture.